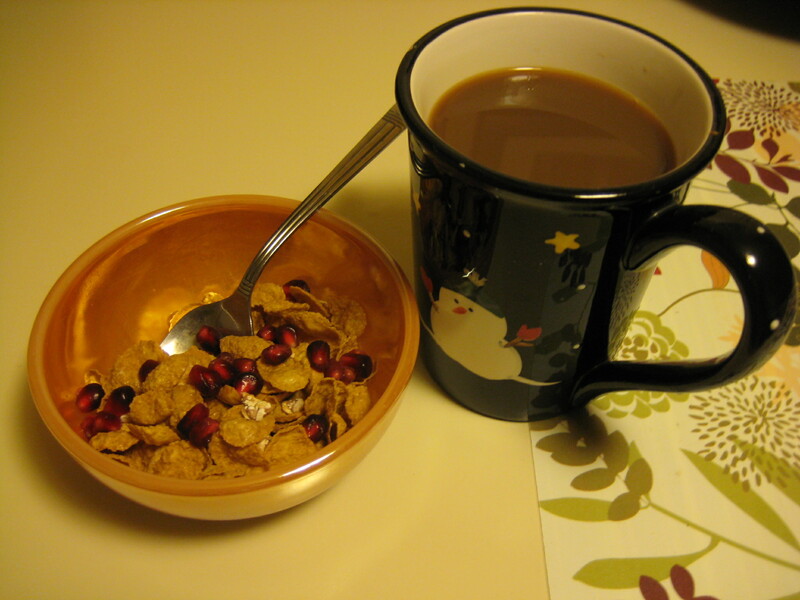 Breakfast today was Total Blueberry and Pomegranate cereal with some POM arils on top. 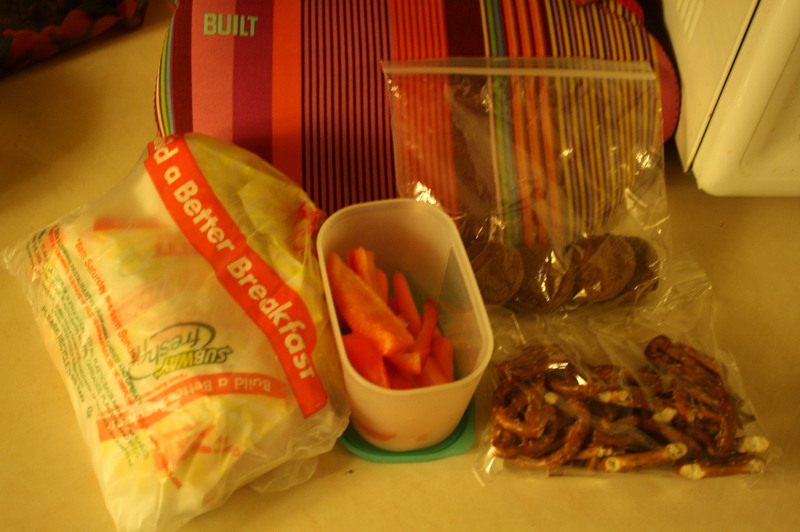 Lunch was the rest of my Subway sandwich, baby carrots, red peppers, Newman’s Own Organic pretzels and Newman’s Own Organic chocolate chocolate chip cookies. This was my first time trying the pretzels. I asked Newman’s Own Organics if I could review some of their food and they sent me a huge package of various items. I’ll be reviewing them over the next week/weeks. 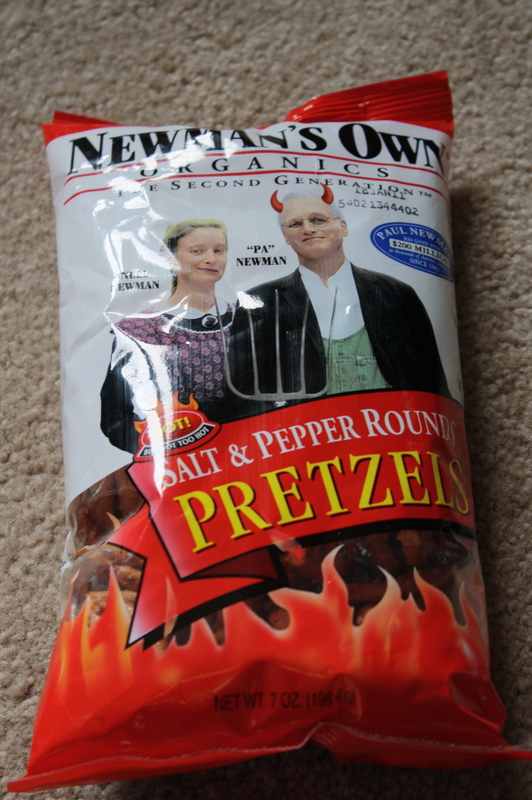 The pretzels were hot as they say on the package, but they weren’t overwhelmingly hot. The heat reminded me of jalapenos or Frank’s Red Hot sauce. I was tired after work and took a little nap. Then, I got to work in the kitchen. I wanted to try out the recipe I am making for Thanksgiving tomorrow to make sure it was ok. 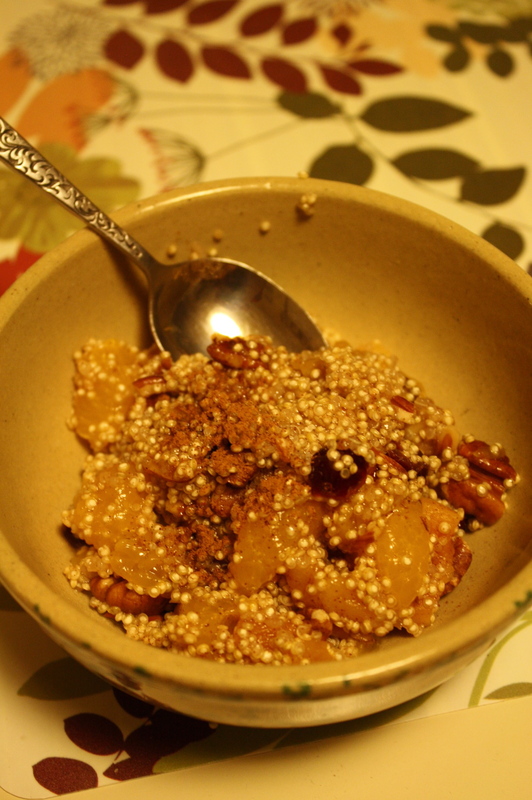 I am making Oh She Glow’s recipe Mandarin and Maple Spiced Quinoa. 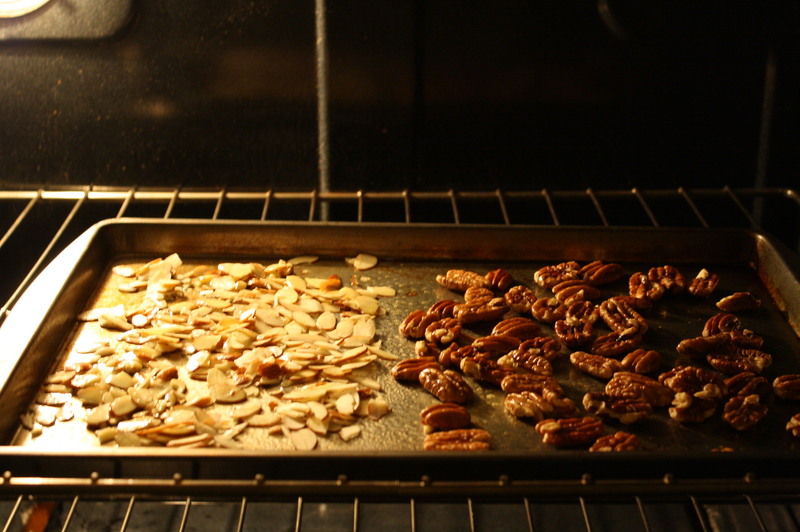 The recipe calls for toasted almonds and pecans. Until about a year ago, I wasn’t really much of a cook or baker. Reading food blogs has helped me with my confidence in the kitchen and I guess writing my own blog also has done the same. I confess that I hadn’t toasted nuts in my life until tonight. My co-worker scared me a bit today, saying that it was hard to do. I just tried it anyway and set the oven for 350 degrees, coated the pan with cooking spray and then coated the sliced almonds and pecans too. They were in the oven for about 10 minutes and I flipped them over a couple of times. They turned out perfect! I am going to toast nuts for recipes more often. It’s so easy. I put the heated oven to good use and baked some brownies too. I measured out the ingredients, followed Oh She Glows’ recipe on my iPod touch and it was really easy to make! I think (hope) it will be a hit tomorrow. 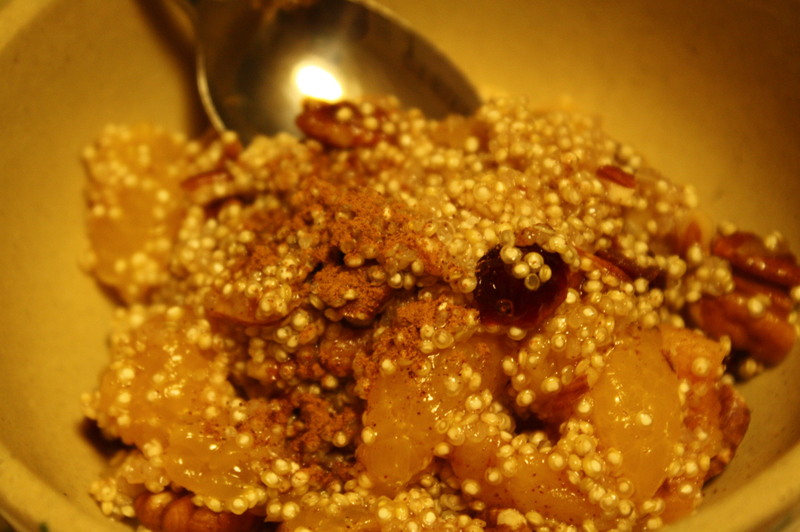 Except for my mom and Craig, all of the guests attending Thanksgiving lunch have never tried Quinoa before. It’s a great dish for fall. I had commented to Craig that it would be good for breakfast and then I reread Oh She Glows’ post and she said the same thing. Chewy, crunchy, and subtly sweet, this dish captures Autumn all in one delicious spot. Directions: Add your quinoa, water, cinnamon, nutmeg, sea salt, and mandarin juice. Bring this mixture to a boil and then reduce to low and simmer for about 12-13 minutes. 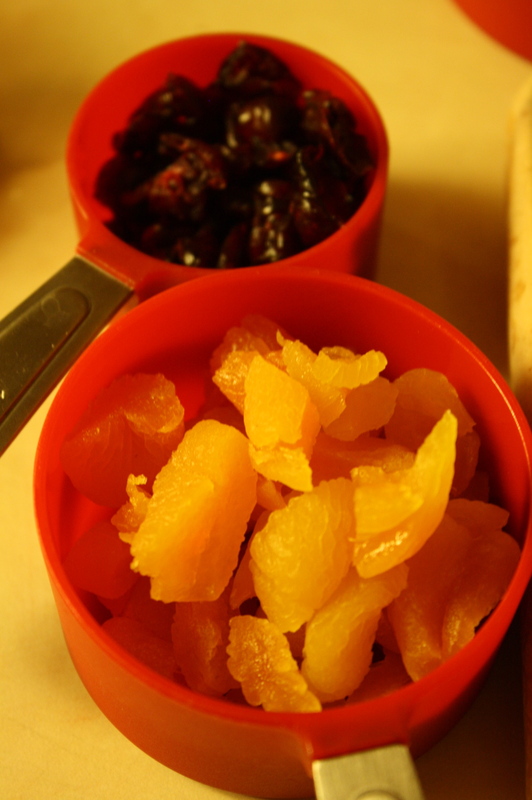 Now stir in your chopped dried apricots and cranberries. Cook on low, covered, for another 5 minutes. Stir in your oil, almonds, and maple syrup. Taste and adjust seasonings if necessary. Stir in the mandarin oranges very gently. Pour into a bowl and garnish with chopped pecans, a drizzle of maple syrup, cinnamon, and sea salt. Makes about 2.5-3 cups.